Belgium vs. England @ 10:00 a.m.
France vs. Croatia @ 11:00 a.m. 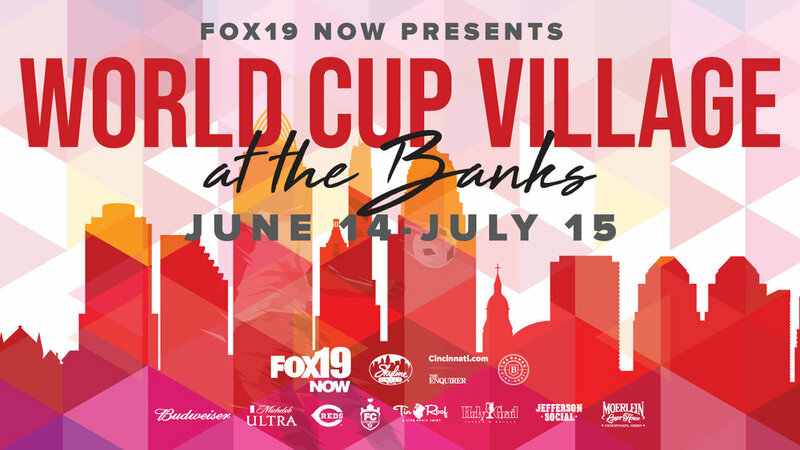 This weekend, The Banks continue the Fox19 Now World Cup Village with ope street parties showing the final matches of the tournament. Last weekend, more than ,000 people watched the matches on Great American Ball Park’s jumbo video screen. Free picnic table seating is available or bring your own chairs. The FC Cincinnati kids’ clinic returns from NOON to 1PM adjacent to Moerlein Lager House. Players and coaches from the home team will be on site to assist ages 5-13 with quick tips and simple drills. Official partner Skyline Chili will return both days to sell chili-cheese coneys for fans during lunch time. Street party at The Banks between Great American Ball Park and Freedom Way. +Saturday, July 14th 9 a.m. - 1 p.m.
+Sunday, July 15th 10 a.m - 2 p.m.
FC Cincinnati clinic will be from 12 p.m.- 1p.m. on Saturday. Rockstead will be playing from 11 a.m. - 12:30 p.m. on Saturday. +32 days of soccer, 6 street parties and 4 official viewing bars. +This is year one of a two year plan for The Banks World Cup Village, culminating with the women’s World Cup next year.